Who else wants a totally unique swimsuit this year? I don’t know about you, but I like my fashion as bold and original as I am. My secret? Vintage wear, baby. But don’t take my word for it. 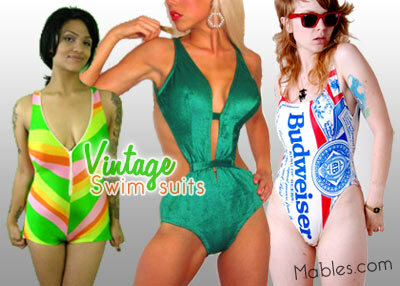 You must see the selection of vintage bathing suits on eBay and Etsy! Unlike new suits, each vintage bathing suit is one of a kind or extremely limited edition, and the range of styles is much more creative than modern swimwear. In vintage, you feel confident knowing you are wearing the most unique swimsuit. Buying vintage online also lets you support the great indie businesses that are healing the economy. Want a brand new vintage style bathing suit? ModCloth has a ton of gorgeous retro styles! PRO TIP: Vintage and Retro swimwear has become increasingly popular since 2009. That means there is always a big rush to find the authentic look from the 50s, 60s, 70s, and 80s as Summer approaches. Vintage clothing sellers from across the country scour their local boutiques, thrift stores, and Grandma’s closets to find the best swim suits from the past. Save yourself hours of time and effort: buy early and buy online. You deserve it.